In his classroom a philosophy teacher opens the discussion on the place of religion in society. Out of his course he faces the realities of the street. In the Quebec countryside during a brutal winter, a woman and her adult daughter await the death of their family's matriarch. A dark comedy about the unwitting emotional pain inflicted on mothers and daughters by their families and one another. 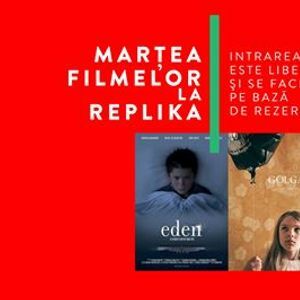 Eden is a period fiction short film based on true facts about a boy in a Portuguese Catholic Seminary, back in 1974, during the Carnation Revolution. It's a story about how challenging authority can lead to freedom. Fascinated by Christianity, a young girl learns the meaning of sacrifice and forgiveness after making a deal with God to ensure her parents’ May Day party goes off without a hitch. A pitch-perfect portrait of infantile adults, the hubris of the creative class, and the importance of questioning your beliefs. Mohamed wants to go back to Morocco, to the house of his grandparents, where he used to spend his summers with his family. It’s been 8 years and he knows the little village close to the beach has changed. There’s a railroad, a new port, the village became a city. But he wants to go back, maybe just out of curiosity, mostly because he misses those hot summers of doing nothing in Morocco. To lighten the ‘confrontation’, he brings his friends. As opposed to Mohamed, they go to party and enjoy summer on the beach.